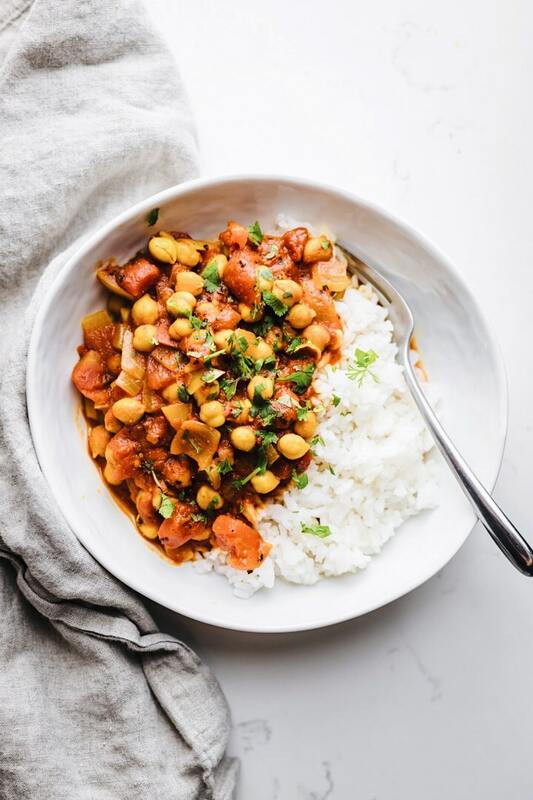 Healthy Moroccan Chickpea Stew – An EASY 30 minute low carb meal filled with plant-based protein, and tons of flavor. To make this vegetarian dinner all you need is 1 pot and a handful of simple ingredients. 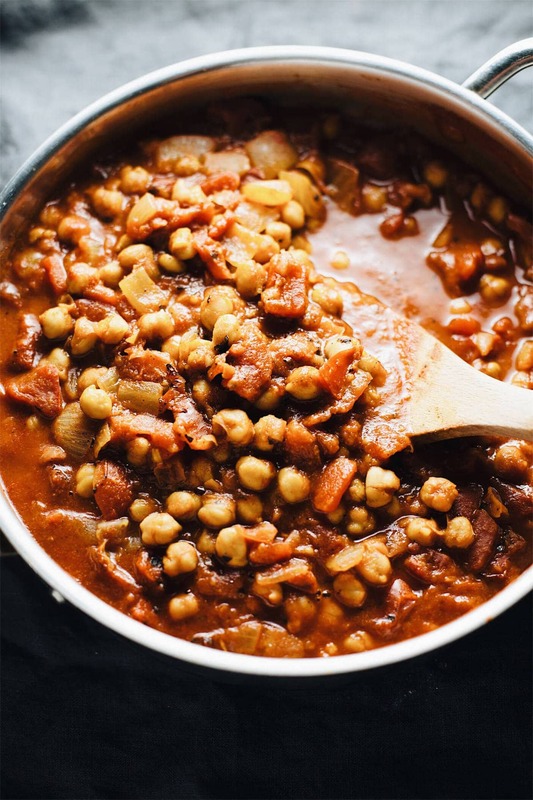 Today we are going to talk about this delicious Moroccan Chickpea Stew. This recipe has everything I love – chickpeas, a hearty sauce, and it’s served over rice. It’s a delicious healthy dinner/lunch option, great for meal prep, and is vegetarian/vegan friendly. 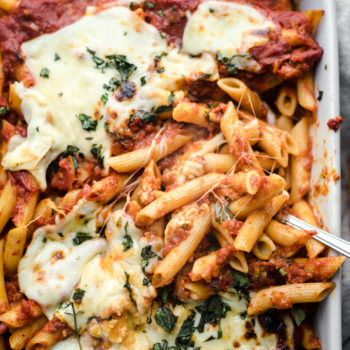 A satisfying dish with tons of bold flavors, made in 30 minutes, and only requires 1 pot. Shall we? Moroccan stew is usually a mixture of onions, vegetables with diced tomatoes and moroccan spices. You can also add lentils, sweet potatoes, or carrots to your stew as well. First, saute chopped onions in olive oil for 3 minutes on medium heat until onions are soft and edges are slightly browned. 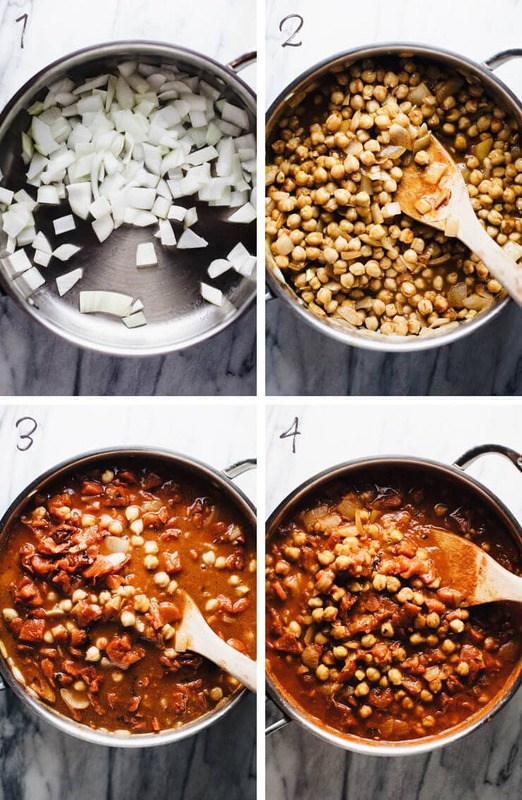 Stir into cooked onions – two cans of drained chickpeas, minced garlic clove, and all seasonings. Cook together for 1 minute so chickpeas are coated in flavor. Add 2 cans of diced tomatoes & tomato paste, 1 cup of water. Let simmer for 20 minutes on low to medium heat, stirring occasionally. The finished product – sauce should be reduced, thicker, and bold with flavor. Don’t have chickpeas? You can use cannellini beans, butter beans, or lentils. Use fire roasted diced tomatoes for extra added flavor. You can serve this chickpea stew with either rice, quinoa, or another favorite grain. Meal preparation is an easy way to choose healthy when you live a busier life. 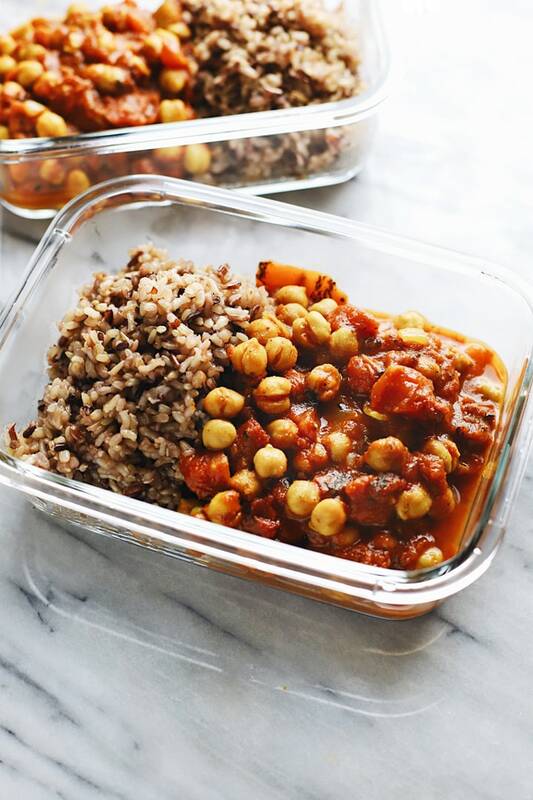 And this moroccan chickpea stew is a no hassle, meal prep friendly recipe. Store this recipe in glass sealed containers with rice or quinoa – store for up to 3-5 days. 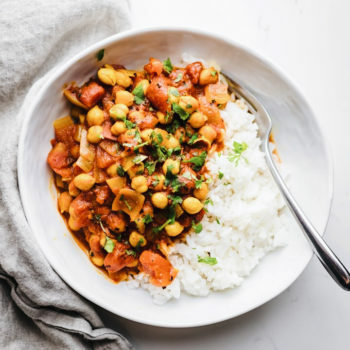 Comforting Moroccan Chickpea stew! A healthy, 30 minute meal that is delicious, filling, and a great vegan/vegetarian recipe. In a medium pot on medium heat, saute diced onion in olive oil for 3 minutes. Stir often, onions should be soft and edges should be slightly brown when done. Add garlic, chickpeas, salt & pepper, spices, and cook for about a minute until fragrant. Add diced tomatoes, water, tomato paste, and simmer on low to medium heat for 20 minutes. Liquids will reduce and sauce will thicken. Serve with cooked rice or quinoa with chopped cilantro. Enjoy! *calorie count does not include rice serving. Don't have chickpeas? You can use cannellini beans, butter beans, or lentils. Meal prep this recipe to have as a prepared lunch or dinner for the busy week ahead. 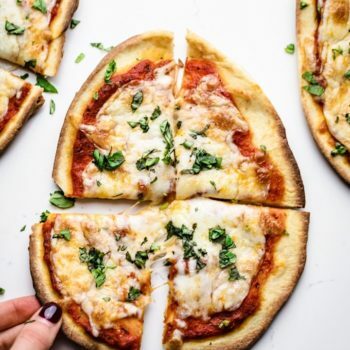 This is another recipe that we are sure to try – and the photos are great! Recently started eating no meat and the hardest thing so far has been finding good meat fulfilling recipes and this by far has achieved that. 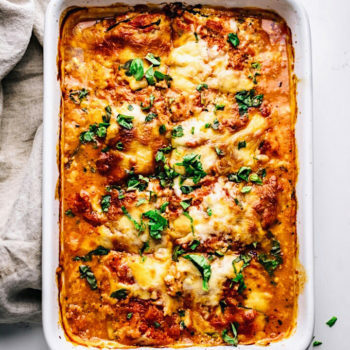 This is such an easy and tasty recipe!! Looks like an awesome recipe! I was wondering what’s the difference between this and Channa Masala (Indian chickpea dish)? Made this for lunches this week. Super easy and super yummy! Anyone know the nutritional values? Made this as a meal prep! Loved it so much especially with the rice. Added a little more spice. So good! I love chickpeas, so I’m really excited to try this. I love how easy stews are to make! Aren’t they? Love how easy this stew is. 🙂 Hope you enjoy this recipe if you try it. Hi! This recipe looks delicious, as I am a big fan of garbanzo beans. I will definitely be trying this out. A question that I have: do you drain the cans of diced tomatoes, or pour them in without draining? Hi Kathryn, I’m a big fan of garbanzo beans as well! I do not drain my diced tomatoes because I actually like the added tomato juices. And fear not, it all reduces and thickens by the end. 🙂 Let me know how you like it when you try it! Excited to make this! I assume that you drain the garbanzo beans before adding the can? Yes! Drain the beans before using. 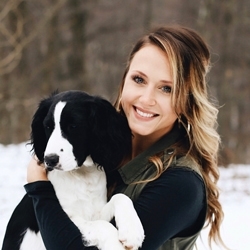 Yay – thank you! 🙂 So glad it could work even without certain seasonings! It’s such a great meatless dinner.